Hi everyone! Welcome to the first Sew-spiration link up party! This will be a weekly link up party for bloggers to come and link up their Sew-spiration (in the form of free sewing projects, sewing how tos, etc) and the readers can come and vote on their favourite link ups for the week! I’m hoping you will all love the Sew-spiration Link Party and I can keep going with it. Let me know your thoughts in the comments down below. The guidelines of the link up might change a bit over the next few weeks as I work out what works best, but I’ll list the guidelines for you below! This is How the First Week Will Work! Saturday – Most popular sewing tutorial or how to will be featured in a new blog post! If your link up is the most popular for the week then I will use an image or two from your tutorial to use in the featured tutorial post linking back to your website. 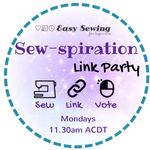 Share the Sew-spiration Link Party with your readers and encourage them to come and vote! Come and check out the sewing tutorials and how tos that have been linked up and visit the ones you like the look of by clicking through to check them out in more detail. Don’t forget to ‘Save Them’ to Pinterest if it’s a great one! You can vote up to 5 times. I’m not sure if you can vote on the same tutorial more than once, but we’ll soon find out! The voting thing is new to me but I love the idea of it! Can’t wait to see all the sewing inspiration – thanks for sharing this! Thanks for participating! I’ve already pinned your tutorials to my Free Easy Sewing Projects for Beginners board on Pinterest. Love them ? so much looking forward to meeting all the sewing bloggers here! Cheers to that, and I have just set up a reminder to get the notification – I’d never want to miss out on it! Me too! Thanks for stopping by and joining in ? This is really fun, thank you for hosting! Thanks for joining in. Your website is new to me so I’ll follow you where I can! Lol! It’s very cute and sewing related so all good! I love the creative use of the pasta machine! Hopefully we’ll have some outfit and quilting projects linking up in the future!